(A) Non-Credited Mechanical abort (CA) Credited Abort-Had reached enemy territory For mission dates and targets see the missions list. F/O Earl L. Weatherby (CP) - Did not fly on six dispatched missions 300, 301, 302(A), 303, 345 & 346 with the F/O Demian Crew. Missions 357 & 358 flown with the 2Lt Malcolm F. Damon crew. 35 mission combat tour completed on 11 April 45. F/O Bernard L. Tractman (N) - Missions 326, 328 & 329 flown with Lt Grafton N. Smith (P) and mission 327 flown with 2Lt Thomas F. Kahler (P). Other missions flown with F/O Demian (P). 35 mission combat tour completed on 24 March 45. F/O William R. Rubins (B/N) - Missions after 23 Feb 45 flown as Navigator. Missions with F/O Demian: 300, 301, 302(A), 303, 304, 308,318, 319, 320 as Bombardier; 326, 327, 328, 329 as Navigator. Missions with other Pilots: 313, 324, 325 & 317 as Bombardier; 322(*), 324(*), 325(*), 327, 331, 333(*), 334(*), 335(*) & 337(*) as Navigator - (*) 7 missions with 1Lt Thomas W. Richardson.The 1Lt Richardson Crew landed at an airfield near Warsaw, Poland with a feathered engine on F/O Rubins' last mission #337 on 15 Mar 1945. All crewmen unhurt. F/O Rubins did not complete his 35 mission combat tour. S/Sgt Harry L. Leach (E) - Flew on all of the F/O Demian missions except for 331 & 333 where a substitute Engineer was utilized. 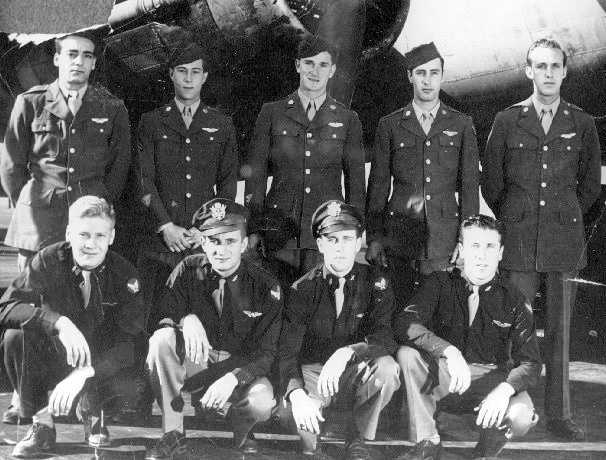 Make up missions were #355 and 356 with 2Lt Robert W. Krohn (P). 35 mission combat tour completed on 10 April 1945. S/Sgt Joseph M. Ross, Jr. (WG & Tog) - Dispatched as Waist Gunner with F/O Demian on 12 missions (300, 301, 302(A), 303, 304, 308, 309, 310(A), 311, 318, 319 & 320). Flew as Togglier with F/O Demian on 26 missions (312, 313, 314, 315 & 317 where substitute Waist Gunners were utilized) and on all other mission on and after 23 Feb 45. Substitute Waist Gunners also used by the F/O Demian crew on missions 321, 327 & 341. The Waist Gunner position was eliminated from the F/O Demian crew on and after mission 322 on 24 Feb 45 except for missions 327 and 341 where a Waist Gunner was used. S/Sgt Ross completed his combat tour on 24 March 45. The F/O Demian Crew used "Y Operators" on missions 301, 315, 322 and 346 and a "Spot Jammer" on mission 335. Missions #302, 15 Jan 45 and #310, 11 Feb 45 - Missions aborted shortly after takeoff for mechanical problems, Were non-credited missions. Mission #339, 18 March 45 - To Berlin, Germany in B-17G 42-97311 Shoo Shoo Baby, 427th BS (GN-O). Mission aborted after reaching enemy territory. Returned to Molesworth alone. Received credit for the aborted mission.